Have A Happy Birthday with a Pottery Painting Birthday Party! Who doesn’t love a balloon on their birthday? While you always get a balloon when you come to Your Creation Station on your birthday…everyone gets one when you have your pottery painting birthday party here! If fact all you really need to do on the big day is show up with your guests and anything you want to serve to eat and drink. We’ll have the streamers, the Happy Birthday banner, table cloths, goodie bags and the balloons ready for you. 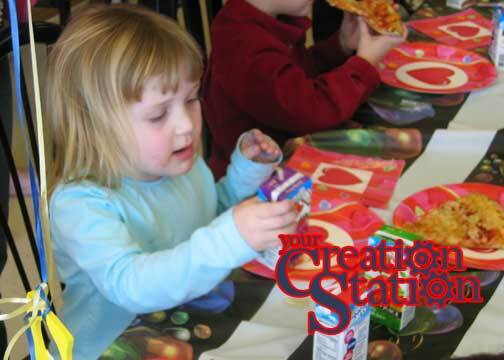 Having a Pottery Painting Birthday party at Your Creation Station is fun, easy and creative. Once all the guest arrive, we start with the hardest part…picking what to paint. While guests are free to pick from any pieces in the store, up to $20, we have a special selection of items to help narrow the choices down. The pieces change from time to time and while we can’t guarantee any particular item will be available you’re more than a little likely to find things like frogs, cats, dogs, dragons, snakes, skateboards among many more options. 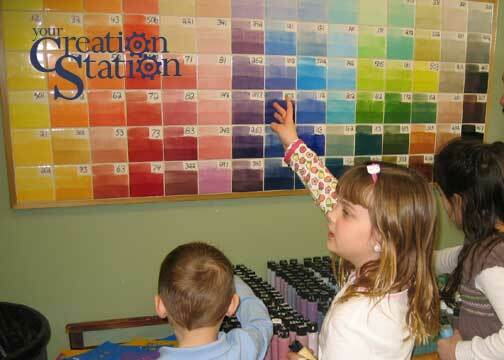 After everyone has their pottery, we pick colors, as many as you like, and start painting! If you decide to do a “Happy Birthday Plate” we’ll sit and paint it with your guests. We start with the base color the birthday child choices and then the embossed “Happy Birthday” letters on top. We hand letter the birthday child’s name across the bottom rim. We’ll also paint a design of their choosing in the middle of the plate. Each plate is different but we’re really good at peace signs, balloons, butterflies, and rainbows just to name a few. More exotic requests aren’t out of the question either…some of the more imaginative designs have included zebra stripes, swirls and even Sponge Bob and Patrick having a Jedi sword fight. Don’t be afraid to keep us on our toes! Once the kids have finished painting, they line up and put their fingerprints on the plate before signing it with a magic marker. Some Moms and Dads even write a message on the back. We’ll paint over the names to before glazing and firing with the rest of the pottery. After all the painting is done, we’ll clear off the table and its time for food, cake and presents! Your welcome to bring as much or as little as you like. Some parties have pizza, some have pretzels from next door and some bring a treat from home. Don’t forget cakes or cupcakes, either is fine but some find cupcakes easier to serve. You’ll have plenty of time at the end too, parties last for about two hours. Once the party is over, we’ll clean everything up, glaze and fire everyone’s pottery, wrap it up and have it ready for you to pick up after the next fire, generally a few days later. Reserving a party is easy, just call up and ask for a date and time. We’ll do parties any day of the week and if you’re the first one that day, you can pick whatever time you like. If other parties are scheduled that day, we try to keep a half hour window between them, this way everyone isn’t stepping over each other. The cost is $24 per child and includes: a piece of pottery per guest priced up to $20, all the decoration, balloons for everyone, a reserved spot in the store for up to 2 hours and goodie bags (containing: candy, another balloon and a $5 off painting card to Your Creation Station. We also include coupons from other local businesses when we can, give us a call if you want your local business to be included). We have no minimum and your only charged for the number of guests who show up. If anyone selects pieces over the limit, we add the difference at the end. We can also make sure guests pick items at any price point you choose. There is a $50 non-refundable deposit required to reserve the time. The party host is responsible for picking up and distributing the pieces…we just don’t have enough room to keep everyone’s here for them to pick up themselves. ‹ Make Your Own Ornaments!